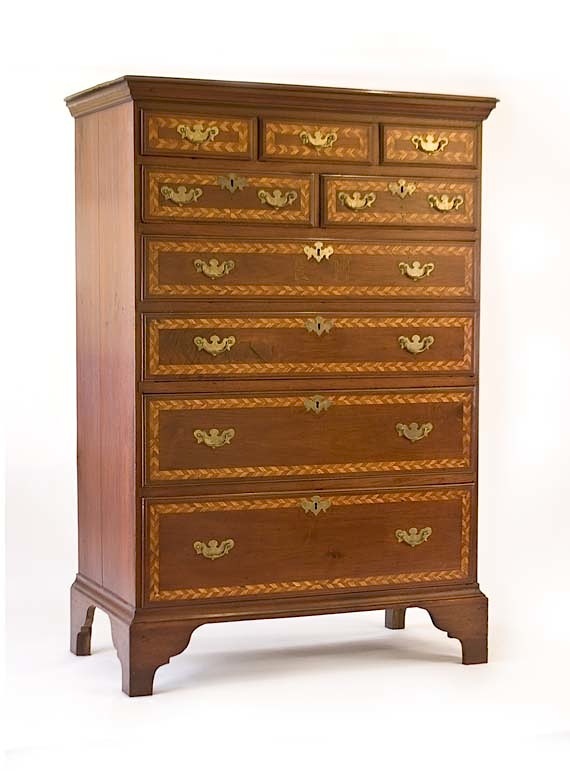 When talking about antique chest of drawers, “chest speak” often mentions drawer layout to describe a piece. You’ll read in a magazine advertisement, in an auction catalog or on a web site that it’s a three-over-five design, or a two-over-three-over four design. What is being described is the number of drawers stacked over the next bank of drawers. The first example would be three drawers set in the top row with five full-width drawers set below. The second example would have two drawer in the top row, and three drawers that make up the second row, with four full-width drawers stacked below. (The top rows are often reversed as shown in the opening photo.) Combinations are endless, but you don’t often see numbers get out of hand. There is something to keep in mind as you look at drawer layout. Is the bank of drawers actually divided into two or three drawers, or is that a single-width drawer made to look like it’s divided? If it’s a single drawer made to look like three, what’s an easy way to duplicate that if you were building the chest? One way is to use an ovolo router bit. The way to use an ovolo bit is to first profile the edge of your drawer front using a roundover bit. Next, chuck the ovolo bit into your router, set the depth of cut to match the roundover profile, clamp a straightedge to the workpiece and run test cut. Measure the distance from your straightedge to the exact center of your ovolo profile. You’ll need that as you layout for the cut in your drawer front. (With my ovolo bit the width of the completed profile is 1″.) Layout work can be tricky. If you don’t pay attention, it’s easy to get the faux fronts a bit off in width. Once the layout work is done, measure from the layout line to where you need to set your straightedge, clamp it in position and you’re ready to divide your drawer front. Work slow as you rout, it’s easy to flip out the profile as the router bit enters the cut. How can you tell the drawer front is not really three individual drawers? Look closely at the vertical divider areas. You’ll see a small gap at the top of each divider if the drawer front is a single-width front and the furnituremaker was attempting to fool your eye.